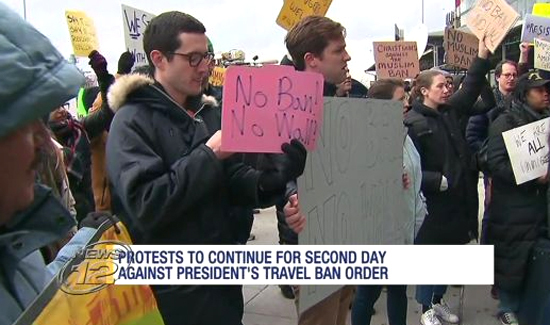 Nearly 24 hours after a federal judge ordered U.S. Customs and Border Protection officers at Washington Dulles International Airport to grant attorneys access to green card holders detained as a result of President Donald Trump’s executive order, customs officials continued to deny them access. But the obstruction went event further. Customs officials refused to speak with several members of Congress who arrived at Dulles to demand that CBP comply with the court order. Airport police officers cordoned off the area where CBP was questioning detained travelers and were preventing anybody from entering. Washington-area Democratic Reps. Gerry Connolly (Va.), Don Beyer (Va.) and Jamie Raskin (Md.) demanded that airport police officers allow them to at least speak to customs officials, but the cops claimed they could do so only if CBP allowed them to. “I am Gerald Connolly, I’m a member of Congress, I represent right up to this airport and we’re asking for access to the people you’re detaining,” Connolly said. Connolly argued that even as an airport police officer, Damskey was legally bound to allow them to speak to CBP to ensure the authorities’ compliance with the court order. “What do you see your responsibility as in terms of enforcing a legitimate federal court order?” Connolly persisted. The police were being reasonable. Politicians grandstanding.